KanaLately, hasn't it been too cold inside the house in the morning? I have not been able to get out of bed; it's so hard to get up in the morning. YujiI know! Eventually, I get up but when I try to get changed, my clothes are so cold, then I lose my motivation to get dressed. KanaExactly. I turn the air-conditioner for heating on first thing in the morning, but it takes a long time to feel warm. YujiI have a heater in my room, so I can feel the warm air quickly. Though I end up being unable to move from in front of the heater. KanaI really hate the cold! Do you think I need to buy something other than the air-conditoner I already have? YujiMaybe. 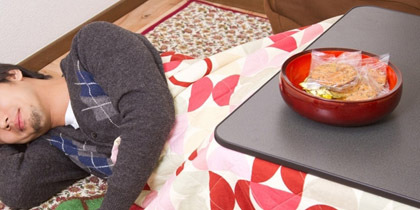 Why don't you buy a kotatsu (heated table)? KanaOh yeah! A kotatsu, but master, that one is a monster. KanaI really think the person who invented the Kotatsu is a genius. YujiI agree. Once you get inside, you can never get out from there. KanaYou can't resist the charm of the kotatsu in winter, can you? I always go to sleep under the kotatsu. When I wake up, my skin gets so dry because of dehydration. YujiI got a sore throat many times because I went to sleep under the kotatsu. KanaHowever, if you are Japanese, you should have mandarins with a kotatsu. KanaThen, I will buy a kotatsu next time. It isn't so expensive, is it? YujiI think It runs the gamut, but I don't think it is too expensive. I think you can buy one at the do-it-yourself store in our neighborhood. KanaOK then, I will go to have a look on my next day off. Can you drive me there, Yuji? YujiAll right. I have no plans for my next day off. kotatsu is a low, wooden table covered by a futon or heavy blanket, upon which a table top sits. Underneath is a heat source, often built into the table itself. If you want to know more, refer to the article below.